200 pages | 12 B/W Illus. Technologies like CRISPR and gene drives are ushering in a new era of genetic engineering, wherein the technical means to modify DNA are cheaper, faster, more accurate, more widely accessible, and with more far-reaching effects than ever before. These cutting-edge technologies raise legal, ethical, cultural, and ecological questions that are so broad and consequential for both human and other-than-human life that they can be difficult to grasp. What is clear, however, is that the power to directly alter not just a singular form of life but also the genetics of entire species and thus the composition of ecosystems is currently both inadequately regulated and undertheorized. In Gene Editing, Law, and the Environment, distinguished scholars from law, the life sciences, philosophy, environmental studies, science and technology studies, animal health, and religious studies examine what is at stake with these new biotechnologies for life and law, both human and beyond. Braverman and the impressive group of authors she assembled lead us through provocative research at the frontiers of biotechnology. This cutting-edge collection is sure to stimulate urgent conversations at the intersection of science and society, which are much needed at this time of awesome and challenging discoveries. With this heady mix of essays by prominent authors from multiple disciplines, editor Irus Braverman accomplishes the nearly impossible: she orchestrates a real-time "constitutional conversation" on the future of the human, as rapidly evolving biological techniques seem to empower humanity to control its own evolution. 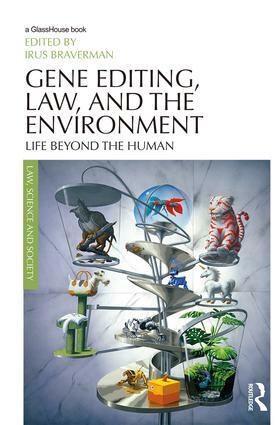 Braverman's superb volume on gene editing provides thought-provoking, broad perspectives from some of the most significant scholars, scientists, ethicists, and environmentalists in their fields. Given the imminence of the dispersal of new gene editing technologies like CRISPR, this masterful collection of probing essays is both timely and important. Braverman's eye for structure, voice, and perspective sets the stage for some of the most difficult legal and ethical issues of gene editing that society will be debating for years to come. 5 Vigilante Environmentalism: Are Gene Drives Changing How We Value and Govern Ecosystems? Irus Braverman is Professor of Law and Adjunct Professor of Geography at the University at Buffalo, The State University of New York. She is author of Planted Flags: Trees, Land, and Law in Israel Palestine (2009), Zooland: The Institution of Captivity (2012), and Wild Life: The Institution of Nature (2015),and co-editor of The Expanding Spaces of Law: A Timely Legal Geography (2014) and Animals, Biopolitics, Law: Lively Legalities (2016).